This salad was super delicious. There’s lots of delicious stuff going on in this salad. Tofu and edamame add protein, the vegetables add a variety of color, texture and nutrients, and the dressing adds a punch of delicious citrusy flavor with salty-sweet flavors from the soy sauce and honey. The ground flaxseed adds a really interesting texture and adds healthy omega-3s to this vitamin rich meal. This is definitely not a boring salad. It’s great all on its own or would be awesome paired with some fish (salmon would be my preference) or grilled shrimp. If you have the time/forethought, I’d recommend pressing the tofu and making the dressing the day before serving, and then letting the tofu marinate overnight before you make the rest of the salad. Or if you’d like to make it all ahead of time just keep the rest of the veggies separate from the dressed kale so they don’t get soggy. Preheat oven to 500°F. 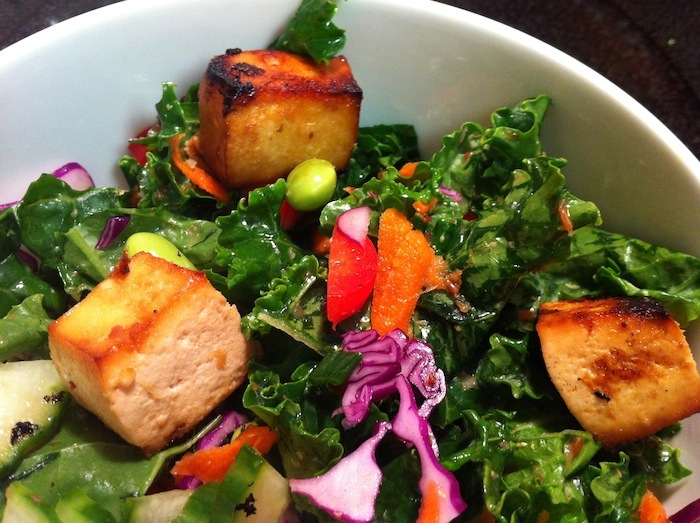 Grease a 9×13″ pan with cooking spray and add pressed and cut tofu in a single layer. In a blender or food processor, blend garlic, vinegar, orange juice, lime juice, soy sauce, honey, ginger, and sesame oil until smooth. Pour half of the mixture over the tofu and toss until coated. Bake for about 30-40 minutes, toss several times to ensure even browning. Meanwhile, add flaxseeds to the remaining dressing and blend. In a large bowl, add chopped kale. Pour 1/3 of the dressing over the kale and then use your clean hands to massage the dressing into the kale. You want each leaf to turn dark green, glossy and tender. Add remaining ingredients and toss to combine. 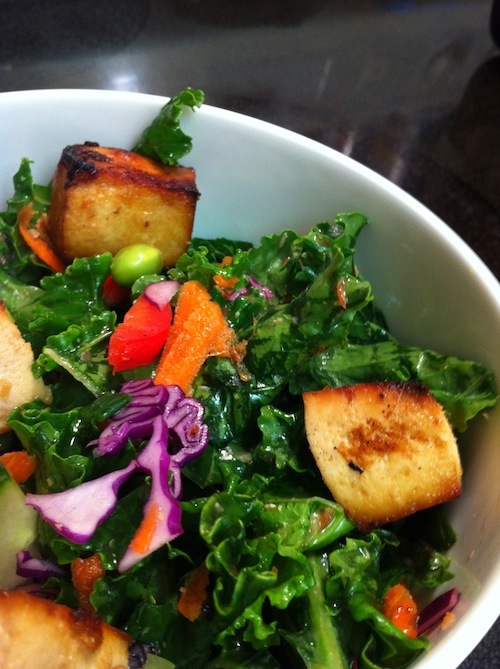 When the tofu is ready, top the salad with tofu and additional dressing as needed. This was delicious.. The dressing had the right tasty,sweet salty combination..Totally want you to make this again! I can’t get over how pretty it is!